Hello friends! Do you know that you can clear borrowed airtime on mtn network? Yes with this new mtn airtime cheat you can clear your debt with a token of N50. This has been tested and confirmed 100% working. 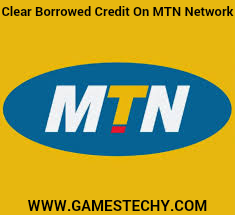 Stay tune as I provide you steps & code to clear borrowed credit on mtn. Relax and grab a bottle of coke, while we roll. First of all, you have to migrate to MTN mpulse by dailing *344 *1# , then select 1. You should now get your self-care PIN , which is the pin sent to your MTN Line after submitting the details above and registering. Lastly, Add Child Number and Gift 50 Naira to the line that is owing. self-care is the pin sent to your MTN SIM after registering in STEP 2. Please Note, the second line must be on Mpulse. That's it, enjoy it while it last because I feel it may not last long before its blocked. The sum of 50 will b deducted for each cleared debt. This post is for educational purpose. please use this trick at your own risk, Gamestechy will not be held responsible if it goes the other ways. This is the latest mtn Airtime Cheat 2019 to clear any amount of airtime borrowed. Enjoy! More tips and tricks will be made available here on Gamestechy. If you have any issues feel free to drop a comment below.